20th Century Football Memories, A limited edition collection of which features stamps and coins from the last century which tie up with famous footballers and football events. 20th Century Football Memories. 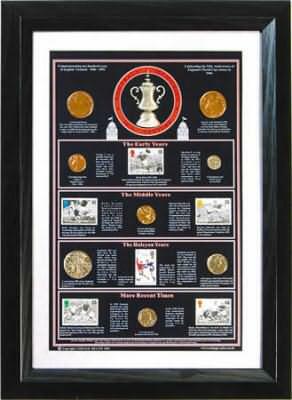 This collection features the famous World Cup Winners stamp issued by the Royal Mint in 1966 after England won the trophy.This item is framed in a black ash frame and measures 454 x 337mm. Celebrating the 35th Anniversary of England's World cup victory in 1966. League increased to 44 clubs in 1919.
took the cup out of England for the only time. The first radio commentary on a Cup Final took place in 1928. A threepence coin which was in use in 1928. Billy Wright was born in ironbridge, Shropshire in 1924, he became the first player to win 100 caps playing for England. the first of three World Cups. He retired in 1959 and died in 1994. A brass threepence in use during Billy Wright's career. with Manchester United and played for England 18 times. He died in the Manchester United air crash of February 1957. Duncan Edwards was born in Dudley, Worcestershire in 1936. he joined Manchester United in 1952 as an amateur. England did not take part in the World Cup until 1950. After 4 dismal attempts Alf ramsey was appointed manager in 1962. England won the World Cup in July 1966 defeating the old enemy West Germany 4 - 2 in extra time. featured is the stamp issued to celebrate the event. A coin from 1950 when England were defeated in the World Cup by the U.S.A.
England went down 3-2 to Scotland in 1967. The team did not qualify for the 1974 World Cup after which Sir Alf was sacked. A five pence coin from 1970. In the World Cup competition in this year England lost to West Germany 3-2 in the quarter finals. Bobby Moore was born in Barking in 1941. He signed for West Ham in 1958 and became England captain in 1962. In 1990 England reached the semi final of the World Cup losing to West Germany in the penalty shoot out. In Euro 96 England again went out in the semi finals losing 6-5 to Germany on penalties. A twenty pence decimal coin from 1998. In the 1998 World Cup competition England qualified but went out to Argentina in the second round by losing 4-3 on penalties. the World Cup finals in 1958. The team was captained by Bobby Moore, Geoff Hurst became the first player to score a hat trick in a World Cup Final.